Inspiration is a funny thing, and it can strike at any time or anywhere. 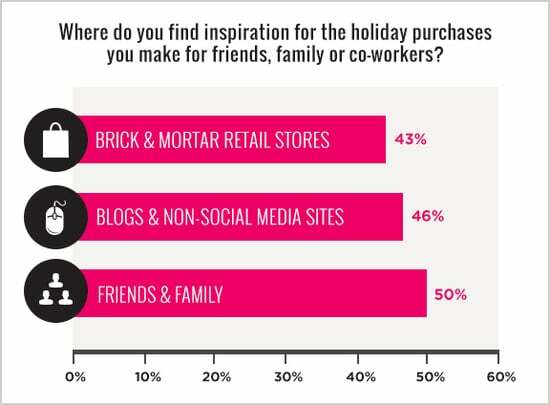 In our 2013 Holiday Shopping report, we wanted to know what inspired women while shopping for gifts this holiday. It was no surprise to us that 50% of women said that conversations with their friends and families inspired them, followed by the content they discovered on blogs and non-social-media sites (46%). What did surprise us is that brick-and-mortar retail stores, or the traditional way of shopping versus browsing the net, are still an important way to shop for women (46%) and that 41% of women said that they still find catalogs a source of inspiration. Among the lowest ranking was inspiration from social media, which came in at 37%. Women between the ages of 18 and 34 ranked conversations with their friends and family as equally inspirational as the content they discovered on blogs and non-social-media sites. This age group also ranked social media above print such as catalogs or magazines. Women above the age of 35 hold to traditional ways of shopping and ranked catalogs, magazines, and conversations with friends and family as their top three sources of inspiration. While conversations with friends and family continue to be a major source of inspiration for all female holiday shoppers, blogs and non-social-media sites are an important source of motivation for women between the ages of 18 and 34. Marketers should take advantage of this digital engagement by partnering with sites to create content that informs, delights, and inspires women to make this their best holiday ever.